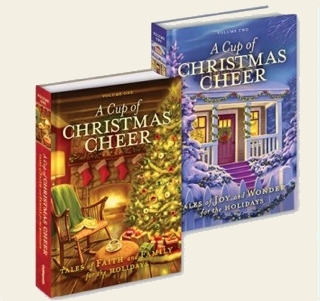 I am delighted to have my story included in A Cup of Christmas Cheer, Volume Three: Heartwarming Tales of Christmas Past. I have enjoyed the entire Guideposts experience and am already thinking about ideas for another Christmas story. “The Plum Pudding Phenomenon” is set in a small town in Colorado during the mid-fifties. Written from the perspective of eleven-year-old Amy Norris, “The Plum Pudding Phenomenon” finds the Norris family struggling with several setbacks. Mr. Norris has lost his job unexpectedly; Abigail, Amy’s mother, has a broken arm, and money is tighter than usual. Amy decides that the annual plum pudding making is just what the family needs to put them in a holiday mood. I was born and raised in Denver, Colorado. The old family plum pudding recipe was the highlight of our Christmas celebrations. I remember with great fondness the annual shopping for ingredients and the full-day of chopping, mixing and steaming the puddings for family and friends. It was a unique and delightful tradition that our family looked forward to each year. Christmas is a time to revel in what makes your family special. Though it’s tempting to try to “keep up with the Joneses,” this is a time to value your family traditions and pass them along to your children. Sometimes those traditions can transform your life and those of friends and neighbors as well! Click image to view source in Wikimedia Commons. In addition to making plum pudding, my own children and I loved making Christmas cookies to give away. Our favorite recipe continues to be for Gingerbread Men. I’ve made these with my grandsons too and given personalized gingerbread men and ladies to friends and family. Do you make Christmas cookies? Do you concentrate on just one recipe, or do you make a variety to give as gifts? in picturesque downtown LaBelle, Florida. Special tea bags will be included! Click this link to be taken to our Rafflecopter drawing. Once there, follow the directions to enter. Drawing ends Dec. 14th. For your protection, do not include personal information in a comment. Congratulations to the giveaway winner, Kimberly P.
Kae Noyce Tienstra has been a book publicist for decades and for the past six years has been a practicing literary agent along with her husband Jon. Kae and Jon have three grown children, three grandchildren and two great grandchildren. They live in Pennsylvania and spend their winters in a tiny town in southwest Florida. Kae finds the sub-tropical winters to be a great inspiration for her writing. In addition to writing short stories, Kae is currently working on a memoir and a middle-grade fantasy.